Many countries advised the return of high-denomination notes to the central bank for destruction, but these continued to be legal tender. This and the introduction of a Rs 2,000 note in India are the two major differences between Indian demonetisation and those of other countries, points out economist Ashok K Lahiri. Normally, current and savings accounts at commercial banks are fully and freely convertible into cash at par. 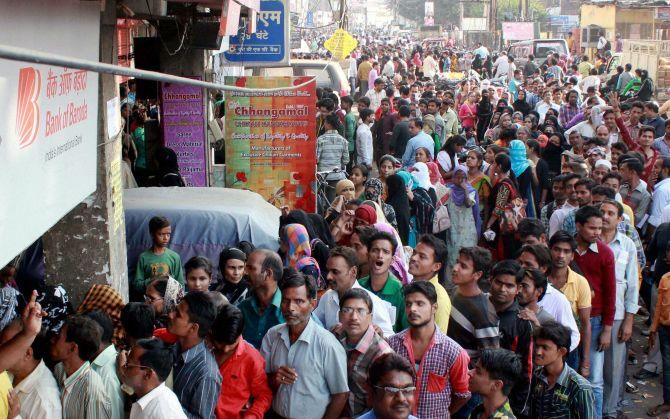 Post-demonetisation, with an interruption of this convertibility, from November 10, when banks opened for business after a day's closure, the country has suffered a cash shortage. You cannot withdraw as much as you want of your money from the bank in cash. Visuals of long queues and endless waits at banks abound in the media. The cash shortage has disrupted people's lives and economic activity. It needs to end soon. The suspension of the legal tender status of the pre-existing Rs 500 and Rs 1,000 notes beyond November 8 by the government and the Reserve Bank of India, together with the associated cash shortage, has been a matter of intense debate. Questions have been raised about its relative costs and economic benefits, and even its morality. The demonetisation, according to the government, has the twin objectives of curbing the menace of fake Indian currency notes and eliminating black money. Interestingly, the two previous episodes of banning high-value notes, on January 12, 1946 and on January 16, 1978, also expressed the objective of containing black marketing or black money. Demonetisation as an antidote for black money has been popular for some time. For example, in 1972, when Marudur Gopalan Ramachandran left Dravida Munnetra Kazhagam, the socio-economic principles and objectives expounded by his All India Anna DMK was called Annaism, named after the late C N Annadurai. Annaism included demonetisation of Rs 100 notes to eliminate black money. Examples of other countries discontinuing high-value currency notes and of countries experiencing cash shortage exist, but separately. Canada stopped issuing the Canadian $1,000 notes from September 2010, as it was often used for money laundering and organised crime. Given the 'risks associated with large-value cash transactions and high-value notes,' Singapore, in July 2014, decided to stop printing the S$10,000 note, one of the world's most valuable bank notes. The European Central Bank, in May 2016, announced that it would stop printing the Euro 500 notes from 2018. In these countries, while the banks were advised to return the high-denomination notes to the central bank for destruction, these continued to be legal tender. This and the introduction of a new Rs 2,000 note in India are the two major differences between the stoppage of printing of high-value notes in other countries and the recent Indian demonetisation. Some countries have also suffered cash shortages, but only under exceptional circumstances, such as hyper-inflation (Austria in 1922), dependence on another country's currency (Panama under Manuel Noriega), dependence on foreign printers and shortage of foreign currency to pay them (Albania in mid-1992), and break-up of a country (Yugoslavia and the former Soviet Union). The on-going cash shortage in India is without any of these exceptional antecedents. A large shadow economy is estimated by some at over a fifth of gross domestic product. This, along with the change in societal norms towards a more accepting attitude, bordering cynicism, towards black money, is troubling. The big painful jolt of demonetisation creates the right psychological milieu for the war against black money to start, some claim. Are government steps, such as the Income Declaration Scheme in the Budget for 2016-17, monitoring black money stashed abroad with the Tax Exchange Information Agreements with several countries, the August 2016 amendment of the Benami Transactions (Prohibition) Act of 1988, and the Taxation Laws (Second Amendment) Bill in November 2016, part of a concerted plan? Will it be any different from what followed in 1946 and 1978? Only time will tell. In the meantime, what needs to end soon is the cash shortage. Cash is the preferred medium of exchange in several transactions, such as in vegetable markets, for road transportation and even some segments of retail trade. It is the lubricant that keeps the wheels of the economy moving. Vegetable prices, normally low around this time of the year because of seasonal factors, for example, have been further affected by the cash shortage. Almost a half of the third quarter was without any cash shortage, but if the shortage continues, its full impact, including on real economic activity, will be in the fourth quarter. Of the Rs 16.6 trillion cash circulating on March 31, 2016, as much as over 85% was circulating in 15.8 billion and 6.3 billion pieces of Rs 500 and Rs 1,000 notes, respectively. By November 8, the numbers may have grown to 16.6 billion and 6.5 billion, respectively -- a total of 23.1 billion pieces demonetised. The government claims the shortage will disappear by end-December. Some commentators say it will take much longer, perhaps as long as May 2017. How long the cash shortage persists will depend on how many of the demonetised notes will have to be substituted and how soon the substitute notes can be secured and distributed. The payments system in India may indeed be in the cusp of a revolution and its transformation may be as fast as that of telephony in the recent past. India may be moving towards a less cash-intensive economy, and the demonetisation itself may hasten the move, but this movement by itself is unlikely to make the post-demonetisation cash shortage disappear. Bank notes are printed at four note presses: At Nashik, Dewas, Mysuru and Salboni, owned by either the government or the RBI. According to the RBI's latest annual report, the total number of notes supplied was 20.9 billion in 2013-2014, 23.6 billion in 2014-2015 and 21.2 billion in 2015-2016, and such supply fell short of indent by 17.5%, 2.3% and 11.3%, respectively. The maximum Rs 500 and Rs 1,000 notes supplied in the last three years were 5 billion and 1 billion in 2014-2015. The cash shortage may take far beyond the calendar year if the reliance is only on supply from these four presses. A quick way to relieve the shortage is to employ the strategy followed by Prime Minister Atal Bihari Vajpayee's government in 1998. To rapidly wipe out the cash shortage, among other things, it decided to import 3,600 million pieces of printed notes adding up to a face value of Rs 1 trillion.